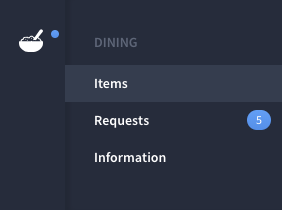 If you want to download an overview of all the meal items, first open the Administrator's overview of the Dining cube in the side bar Dining | Items. Where downloaded files are stored depends on the Operating System of your computer, tablet or smartphone. Please refer to the manual of your device if you cannot find it. Usually downloaded files are stored in a folder called Downloads.